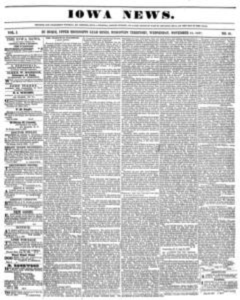 Newspapers have been providing Iowans with “the first draft of recorded history” for over 180 years. As Iowans, we believe that the preservation of our collective history is a shared responsibility. We want other like-minded Iowans to join the State Historical Society of Iowa and Advantage Archives in their mission to ensure that Iowa’s “first draft of history” is available for current and future generations. What is the focus and scope of IAhistory? 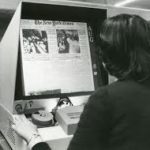 The focus of the project is simple: Continue our work with Iowa libraries to microfilm their newspapers and providing digital access to the preserved content. 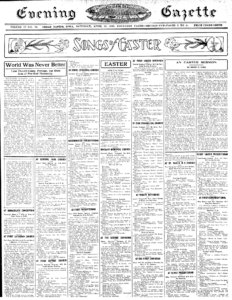 This will result in a consolidated collection of Iowa newspapers that can will be shared by the libraries across the state, and available in every classroom as a resource for Iowa’s students. The question of scope is more difficult to answer. It is our opinion, that the true scope can only be determined through an ongoing community by community assessment of the need. The scope of the project will not fully be known until the materials are cataloged and cross-referenced at our facility and through “boots on the ground” fact finding that is not practical or possible now. There will be many factors that influence the scope, and it will continue to evolve with almost every new community evaluation. Among the considerations: The State’s collection of bound newspaper volumes in Des Moines, the State’s collection of bound volumes in Iowa City, in Iowa City, the State’s collection of microfilm in our facility, microfilm and/or digital images produced by Advantage for libraries and publishers independent of relationship with the State, private collections, projects performed by other vendors, at risk materials, materials of inferior quality, materials not filmed to standards, damaged/defects within current collections, and missing materials that are known to have existed but do not exist in any of the collections. The only feasible and cost effective approach to this is at the local community level. There does not seem to be a “point of truth” that ties all the data points for all the different collections, media, and custodianship. By bringing together strategic community partners, each contributing and/or benefiting in different but equally important ways, allows for a more comprehensive understanding of the need. The Publisher will provide permissions to use of their content, provide access to best possible images available via pre press files or other digital files in their possession, waive any royalties or revenue considerations for the use of their intellectual property in this project, and provide community awareness as to the contributions of those involved in making this project possible. The individual libraries will provide access to the community and share their existing collection with other Iowa libraries and SHSI, engage their Foundation / Donor Network to help secure the funding in a model for that community that align with their efforts and methods. Local community businesses will continue to sponsor the preservation and service work, primarily via existing partnerships with Friends of the Library (or similar programs) and continued support from the Library Foundations which have been the primary funding source for Iowa preservation/access efforts the last several years. Other key relationships such as the Association Of Iowa Museums, Department of Education, State Library, State Curator, local genealogical and historical societies, INA, IPTV/IPR, and other respected Iowan’s with a connection to history, education, or cultural awareness will be consulted regularly in an effort to guide us, educate us, and collaborate with us in making the IAHistory website a valuable educational tool. Through these relationships we hope to keep community awareness high, and through this awareness, engage other like minded Iowans to join us in our collective effort to preserve our own history. Each community will receive an online archive provided courtesy of the library and publisher (funded by Foundation or other library donors/sponsors). Currently there are 280 Advantage library collections in Iowa. The website belongs to the library and is hosted and maintained by Advantage Archives. There will be no subscription or annual fee for this service. The only recurring costs would be to add additional material to the collection or non-newspaper materials that fall outside of the scope of the IAHistory project as well as any “day forward services” (ongoing microfilming or digitization services). In addition, the library will receive a searchable External USB hard drive with all of the images of their collection. As new material is made available, the hard drive will be updated. The library will own this hard drive as a tangible deliverable to compliment the website and serve as a second copy of their data for storage. Should the Hard drive become damaged or corrupted, The Advantage Companies will replace the images at no charge to the Library, and they also are encouraged to make their own copies. The Publisher(s) and the State will also receive a copy of anything created as part of the IAHistory project, ensuring that there will be multiple copies of anything created, living in multiple institutions and geographical locations. In addition to the local community archive, the Library, Publisher, State, and local community Schools will receive access to IAhistory.com. 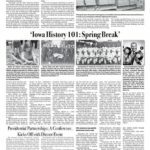 IAhistory.com will consist of all Iowa newspaper and historical documents that are available for use. This includes any/all content produced prior to, and as a part of this project. 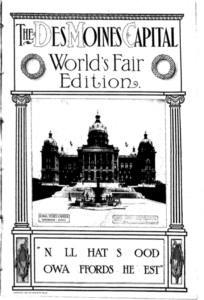 This will include all participating Iowa publisher, library, state, and private collections, and all images that are in the public domain that have been digitized if originally published prior to 1924. 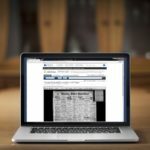 IAhistory.com will only be available through IP authentication or other restricted access, and will not be available to users from outside the walls of those participating locations, However anyone can access the community collections for free at any time. 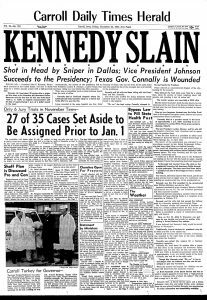 Advantage Preservation is dedicated solely to the preservation and digital access of historical newspaper content. Working with over 500 libraries and newspaper publishers across the country, Advantage Preservation carefully captures the “first draft of history” to microfilm in accordance to ANSI/AIIM standards for 500-year preservation. In addition, Advantage provides online access to that content as an enhancement to the preservation process, making that valuable content more easily accessible. Access the uniques and valuable history from hundreds of Iowa communities via the Community History Archives. Advantage Preservation, The State Historical Society of Iowa, Community Publishers, Libraries, and other like minded Iowans have come together to make local content more accessible as a result of the ongoing preservation efforts. Learn more about how to use the Community History Archives. The State’s current estimate of physical newspapers is approximately 10 million newspaper pages. There may be significant duplication, as the states collection is contained at two separate collections.